lesliekeating: handprinting: get to it! alrighty folks, the swap sign ups are closed and all swapees have been emailed with their group details so let the designing and printing begin! i've been getting a lot of questions about fabric and ink so i thought i'd write a (sure-to-be-very-incomplete) resource list here for you guys to refer to. you can find decent quality cotton, linen and linen/cotton blends at most large fabric stores (in melbourne: spotlight, lincraft, darn cheap fabrics). for cotton i'd choose a twill or duck, something with a bit of weight to it but that still has a nice hand. linen/cotton is a great choice because it's usually a medium weight and not too stiff plus it's fairly economical (spotlight just released their own brand of linen/cotton i spied instore the other day and it's a bit light but otherwise pretty nice, lincraft and darn cheap both have a few different linen/cotton options). pure linen is a bit trickier because the medium weight weaves are usually pretty pricey (but sooooo nice) unless you can find a remnant or sale (in melbourne: clegs, tessuti, the fabric store, sometimes rathdowne remnants). 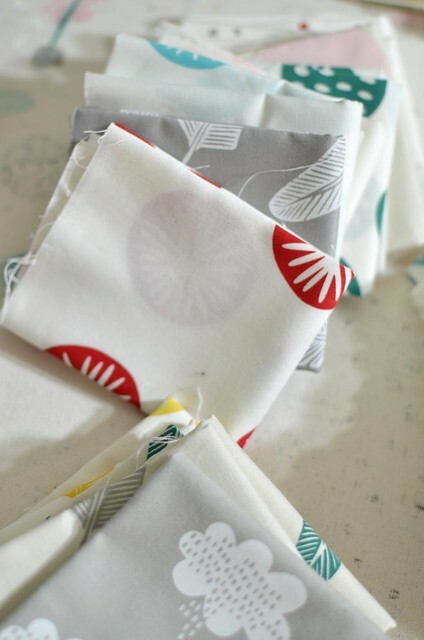 of course all of these fabrics can be found online (etsy, grayline linen, fabric.com, among others) along with hemp and bamboo blends which would also meet the swap criteria. for screen printing, i've used both speedball and permaset inks which should be available at all major art/craft stores and are readily available online all over the world. i've used the same inks for block printing/stamping by pouring some on a plate and using a foam brush to dab the ink onto the block/stamp and have used setacolor transparent and opaque inks the same way (note: spotlight does not carry speedball or permaset but does carry setacolor, my local art shop has all of them and is pretty small so i'm assuming most would). i picked up some martha stewart craft paint at michael's in canada last year that says it is for use on all surfaces, including fabric but i haven't tried it yet - it was very cheap and came in great colours so it's worth a try. there is also a textile medium you can buy to add to most acrylic paints to make them permanent on fabric, check in the craft paint section at art/craft retailers. I was planning to use VersaCraft ink since it's permanent on fabric after heat setting it... unless that's not okay? hi alli, i'm sure there are a bunch of other brands out there that i haven't seen before and the versacraft will be great. any ink/paint that says it is permanent on fabric will do the trick! can't wait to see your prints! Lincraft stocks 'So Soft' fabric paint too - it's flexible and sinks in really well. The bottles are small and cheap - about $4 I think - great for a small project and experimenting. Hello, I have an unbleach muslin 100% cotton for years, waiting to be used. I don't know if is lighter or it's okay for print. where do you sign up for emails??? this is just what I need..